Modern cars are getting more and more advanced with a lot of parts that require a lot of electric power. That’s why a good car battery is one of the most important parts of a modern car. A car battery may seem like a simple part and it does not matter which battery you choose, that’s totally wrong. Choosing the right battery can save you a lot of time and money. I work as a diagnostic technician and I’ve seen a lot of problems in cars caused by a bad/faulty battery. That is why I decided to write this article. In this list, you will find the top best car batteries in my opinion to buy and I’m answering the most important questions about car batteries. Because I know the importance of a good battery whenever the weather is cold, I only listed the absolutely best car batteries on the market. My recommendation is to spend your money wisely and buy quality car battery when you are looking for one of the most important parts of your vehicle. If you want to learn a bit more before purchasing a car battery, check our buyer’s guide at the bottom of the article. Scroll down or click here. Always make sure the battery fits your car before purchase. The YellowTop is even better than the Optima Redtop battery. 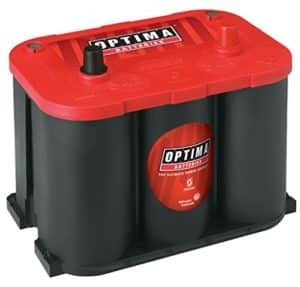 Optima is probably the best car battery brand on the market. That’s why I decided to rank this car battery at #1 on this list. A small battery that gives a very high power output with a great quality. The top series battery from the probably best battery manufacturer in the world. With these batteries, you will not get disappointed. A very long lifetime which you can save pretty fast from buying cheap car batteries once a year. This one is the best car battery for cold weather. The Yellow top is ranked as the best battery out there in the market for certain reasons. It is the battery with which the customers are most satisfied. It provides a constant performance capacity on reserve for as long as 98 minutes once fully charged. The C20 capacity of the battery gives it a 48 Ampere hour. It is highly resistant to vibrations and considered to be as much as 15 times more resistant to the vibrations compared to the other conventional batteries. Due to this, the performance and the overall life of the battery are improved. The battery can demonstrate an optimum starting power even when the weather is bad. Among the several benefits of this battery, one is the efficient cold cranking of 650 amps. This kind of amps renders this battery so powerful that it can easily start an outboard motor of small or mid-size. The size of the battery is small which is detrimental to its compact design. It is easily handled and portable. It weighs around 36 pounds with the dimensions of 7 by ten inches. This battery is suitable for on road as well as off-road vehicles, such as the boats and cars that do not have sufficient space to mount bigger sized batteries. It has a plastic body which is thick and very durable. This gives it a capability of fifteen times better resistance to the vibrations compared to the other conventional lead-acid batteries. This battery also utilizes the AGM technology, which improves the overall performance of the battery and increases the life of the battery. It has a deep cycling capability due to a reserve capacity of 98 minutes after a full charge. The overcharging issue can be experienced due to the AGM technology used in this battery. Therefore, you should charge it carefully to make sure that you do not overcharge the battery as it can damage the performance and reduce the battery life. This battery also has effective weather resistance capabilities due to which you can experience a better performance. The rigid, strong and thick exterior structure ensures the durability as well. The biggest benefit of this battery is the versatility that it has. It is suitable for almost all of the small to mid-sized motors and other parts that require a moderate amount of energy. It can be mounted in various positions due to its portable size and the design. It can withstand vibrations, abuse, and jerking. It also provides higher power and cleaner power for audio systems in your vehicle compared to other batteries. With the Yellowtop battery, you get a 36-months personal use warranty and 12 months for commercial use. You can get these batteries with different battery terminals fittings. Check amazon page for battery alternatives. Optima batteries, do I have to say more? 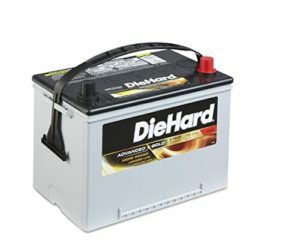 Probably the best and most known batteries on the market and the best car battery brand. With these batteries, your car will start in all weathers. The redtop batteries are often enough for the most cars on the market. It’s small in size and can be fitted to both small and mid-sized cars. This is an AGM battery and you can mount it in which direction you like. This battery contains the reserve capacity of as long as 100 minutes for ensuring constant performance. It is also fifteen times more vibration resistant which enhances the durability of the battery and increases the battery life. this battery has an optimum starting power. The life of this battery is twice as long as the conventional lead-acid batteries. It also has the strongest 5-second starting power among all the other batteries. It is also durable against elevated temperatures. It can endure severe vibrations given its durability. The battery is also leakage and spillage proof which promotes its corrosion resistant capabilities. The Optima warranty is 36 months for personal use and 12 months for commercial use. You can also add an Amazon warranty for an additional cost. If you are looking for a high-performing battery with the size of the batteries mentioned before, this should be your choice. Also, this is a high-quality AGM battery which makes it totally maintenance free. A perfect mid-sized car battery with high power. Diehard batteries have certain unique features, such as 20 times more efficient vibration protection system which protects the battery life as well as the performance. Moreover, the diehard battery has two times the cycle life which can improve the efficiency and increase the life of the battery in comparison to the conventionally used lead-acid batteries. This battery comes in a spill-proof body and the protective design provides a safeguard to the sensitive electronic equipment. It is also equipped with the optimized power full frame positive and negative terminals. These can effectively prevent the damage to the user as well as the battery from the electric shocks. Furthermore, the battery has a specially designed electrolyte suspension system. This system can serve as an effective protection of the internal components of the battery by absorbing any excess electrolyte. This battery is suitable for both on-road and off-road vehicles, including the water vehicles due to its body design. It is also designed to tolerate the temperature extremes that can be experienced due to weather or overheating of the battery without degrading the life and performance of the battery. Moreover, the battery utilizes the AGM technology which is very effective for increasing the battery life and improving the performance of the battery. It is easily mountable in any position due to its enclosed design, leakage and spillage proof body and it will not require any maintenance. It fulfills the state of the art technology implications in the battery industry of today’s world. it consists of improved equipment and the calcium lead allow grids. The design of this battery is specially made for a northern climate, which is why it can vulnerable to weather and seasonal changes as well as elevated temperatures. This battery is also capable of rapid recharging to more electronics for a longer period of time. it utilizes the flat plate AGM design, which can be efficient in terms of providing the power per pound volume. With the DieHard Advanced Gold series, you get a 3 years free replacement warranty. The terminals are “Top Left Front Negative” and fit the most Europe cars like BMW, Audi, Mercedes and Volvo etc. But it does also fit a lot of American cars. A perfect battery if you are looking for a larger battery than the ACDB24R. This is also an AGM battery with a really high power output. With this battery, you will get performance to start the most cars on the market. It is not only charged receptively but also has a high cycling capability. It can ensure that the application of the battery in your vehicle is improved. It also has the AGM or absorbed glass mat design which can protect the battery from any leakage or spillage. This spillage is stopped with the help of a glass mat separator as the liquid electrolyte is permanently held. The loss of water is reduced by the recombination of oxygen, which ensures that the battery does not require maintenance. The company also claims that the battery has a longer life expectancy among the other competitors in the market offering traditional battery designs. Acid leakage is prevented with the design of vent caps. With this battery, you get the whole 36 months free replacement warranty which indicates that this is a really high-quality battery. 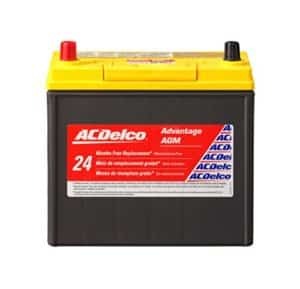 This battery has the battery terminals mirrored from the ACDB24R ( The most common connections ). It also uses larger terminals ( More common terminals ). 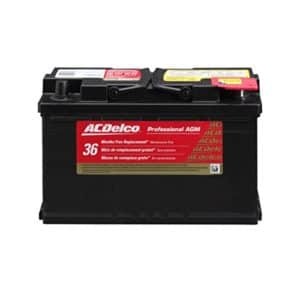 The ACDelco ACDB24R is a small battery that is best fit for smaller cars. A pure high-quality AGM battery that is absolutely maintenance free. This battery offers several features which make it stand out among others. There is a gas regulation valve provided in it based on the recombinant technology. The cycle life of the battery due to this is improved three folds compared to other traditional vehicle batteries that are found in the conventional vehicle applications. It also offers the absorbed glass mat or AGM technology, which makes it maintenance free. With this technology, the battery does not require any water to be added from time to time. furthermore, it can ensure that there are no leaks and spills from the battery. It cuts things down to zero maintenance which makes it a very attractive option. Further to that, the terminals are made of calcium, consisting of the negative and the positive. It provides enhanced cranking amps to the battery and reduces the rate of self-discharge which can improve the battery life significantly. As a result, it offers a full frame power path grid, comparable with the calcium and antimony flooded technology. The battery can further prevent the leaks due to its leak-proof design, consisting of a leak-proof pressurized valve system. This system ensures that the longevity of the battery is maintained in terms of battery life and the safety and prevention are ensured. It also protects the battery from the damaging conditions such as terminal damage due to the acid and the drying out of the battery. This battery also contains the best available high-density plate oxides. These are effective in terms of maximizing the power per pound that is provided to the system and increases the dependable high cycling service. You get a 24 months free replacement warranty if you are not satisfied with the battery. The battery is using smaller battery terminals which are often fitted with Asian cars. Make sure that you are using the same terminals before purchase. A really price-worth battery if you are looking for a small battery for your car. For most batteries, an average lifespan is of four to five years. However, it depends on the use as well as maintenance. The latest battery designs require minimum maintenance. Here are some of the things that you should consider while buying a battery for your vehicle. It is good to make sure that your battery is fresh. you can do that by checking the code of the battery which indicates the month and the year of the manufacture of your battery. Make sure you don’t buy a battery that was manufactured more than six months ago. Different companies offer different warranties for their batteries. Choosing a battery that has a longer warranty time period and offers a free replacement can save you from a lot of trouble. It is also considered as a sign of promise for quality that a company makes to their customers. If you are looking for a replacement of your old battery with a new one, it is a good idea to get the battery life of your older battery tested. Sometimes your old battery may only need a quick maintenance to function properly. If that is the case, the specialist will let you know whether or not you should buy a new battery. You should take into consideration the reviews that are left by the customers online about the battery life and their experience with it. All the batteries are bound to receive positive as well as negative feedback. Therefore, you should look into both types of reviews to see if you should go for a particular company or not. This is another factor that can help you choose the right battery for you. While some batteries require a regular maintenance, there are certain latest designs that are maintenance free. This means that you will not have to go through the regular hassle of keeping your battery maintained, and it will take care of itself. The power of your battery should fulfil the requirement of power that you have for your vehicle. this power measure is known as the cold cranking amps. Furthermore, you should also take into consideration the reserve capacity of a battery. Q: What size of the battery should I choose? A: The simplest answer to this is: Check what size of the battery that is fitted in your car now. The most batteries are located under the hood, but some can also be fitted in the trunk or under a seat. Check your repair manual or call your authorized dealer to get a fast answer. Measure the size: Height, width and length. Also, check if you can find the “Ah” number on the battery. Often you can fit a little larger battery then the battery fitted from factory, just measure and check if there is enough room. I do not recommend to fit a smaller battery than the factory battery, because it may not have enough capacity and make strange problems with your car. Q: How do I know if the battery fits my car? A: If you are following one of the links to Amazon from this article, you can see a top bar at Amazon’s website where you can choose your car model. But to be 100% it fits. Always check the length, height, width and Ah before ordering a battery. Also, check the battery terminals. They can have different sizes and be mirrored ( Terminals placed on different sides of the battery ). Asian cars do often have smaller battery terminals than Europe/America. Q: What are AGM battery and which are the benefits? A: AGM is a shortening of Absorbent Glass Mat. The sulfuric acid is absorbed by a fine fibreglass mat, which is making the battery spill-proof. The benefits of the AGM battery is Maintenance free ( Do not have to fill it ), Higher Performance, Faster Charging time, Vibrations resistance, stands up well to cold temperatures. As you see, there are many benefits with an AGM battery. The less positive thing with an AGM battery is often that the price is higher and it’s more sensitive to over-charging. AGM batteries are perfect in cold weathers. Q: What are Ah and Peak A? A: Ah is the measurements of the battery in ideal conditions, fully charged. Ah = Ampere Hour. It is the measurement of how many amperes it can put out in one hour full-charged. Peak A is the measurement of how much Ampere the battery can put out under short times and high-loads. Q: How to charge my battery the best way? A: Slow charging with a smart car battery charger is the best way. If you have a smart car battery charger, it will handle it for you. If you want to learn more about this, check our article “How to charge a car battery the best way”. If you want to find the best car battery charger for your car, check out our review article: Car battery chargers. Q: What is the expected lifetime of a battery? A: Normally with a good quality battery, the lifetime is around 5 years. I have seen car batteries that have been working over 10 years. The most important part to higher your batteries lifetime is to not let it stand with a low amount of charge. Especially if you are living in a cold country. One night of low temperatures and low charge can kill the battery instantly. Also, many low-cost batteries have lifetimes of around 2 years. If you are adding the cost of a car battery that has a lifetime of 10 years, the high priced battery is actually cheaper. Q: My car is draining out the battery of my car, how to fix it? Q: Do I have to fill an AGM battery with battery-water? A: No, The AGM battery is maintenance free and sealed. What you can do is to clean up the battery terminals once a year to make sure the terminals have a good connection. Maintenance charging a battery is always good and may give your car battery a longer lifetime. Q: Can I safely jump start my old battery? A: There is always a risk of jump-starting a car. New Jump starters do often have both wrong-polarity protection and overvoltage protection so the risk is very low if you are using the right tools. If you want to read more about jump starters you can check out our other article Battery Jump Starters. Jump starting with jumper cables is a risk of wrong-polarity, but the overvoltage risk is not there. Q: How to replace my battery? A: First you have to locate your battery. The most common location is under the hood, but on some cars, the battery is located in the trunk or under a seat. Check your repair manual to locate your battery. Always lift the negative battery terminal first, to prevent any sparks ( Which can make the battery explode if it’s leaking ) and connect the positive first on the new battery. Always use protection glasses and gloves when you are replacing a car battery. I have seen one exploded when my colleague replaced a battery, so be very careful. Q: How can I tell if my old battery is bad? A: If you have tried to charge your battery several times, but it still sounds tired when you are trying to charge your battery, your battery is probably bad. There are several good battery testers on the market that will tell you if it’s time to replace your battery or not. One of those is the Cartman 12V Car Battery & Alternator Tester. Q: Why should I remove the negative terminal first? A: By removing the negative terminal first you will prevent any sparks. If you get a spark and your battery is leaking gas, the battery can explode and cause serious damage. Always use protection glasses and gloves when you are replacing a car battery. I have seen one exploded when my colleague replaced a battery, so be very careful. Q: Is the temperature outside affecting the lifetime of a car battery? If you have other questions about car batteries, comment at the bottom of the article. Choosing the right car battery is not a very simple task. I hope you have learned how to find the right battery for your car. I also hope that you understand the importance of a good high-quality battery in your car. Never buy cheap car batteries, it will only cause a headache for you and it will probably get more expensive in the long run. If you have further questions, comment down below with your questions and I’ll answer them as soon as possible. If you have other car questions that you want answers for. We have a free service where we answer all car questions for free. You can register and ask us for free at our homepage. If you liked this article, check out our other free car articles on our homepage. A recommended article of other tools that I recommend, you should see Recommended tools for car owners.